Our Body Shop features 10 large crane equipped repair bays totaling 10,000 square feet and specializes in collision repair on all heavy duty truck makes and models. Our Factory Trained Technicians can quickly restore your vehicle to pre-collision condition and get you back on the road fast! Our conveniently located Body Shop is equipped with state of the art tooling including alignment and VIS (Vehicle Inspection Service) technology. We provide a one-stop shop for all your vehicle maintenance needs. We work on all makes and models of heavy duty trucks as well as buses, RV Trailers & Motorhomes. Heated paint booths for superior refinishing. 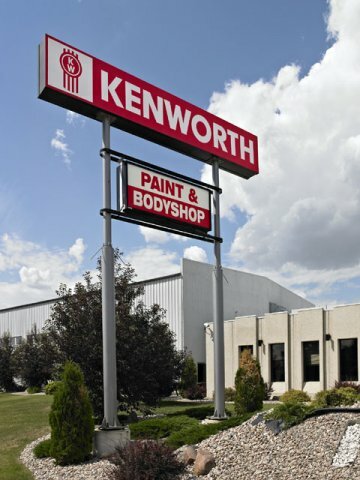 From touch-ups to complete paint jobs we provide superior quality! We look forward to the opportunity to provide you with a service level that can be matched by no other competitor. We understand your needs and encourage you to allow us the opportunity to earn your business! To book your appointment, please call 780-449-2670 or email bresendes@edmkw.com for a free collision and refinishing estimate. We can come to your location if needed and will work with all insurance companies to help you through the difficult task of getting your truck up and going quickly.